Oil on canvas, 32,5 x 48,5 cm. During the summer months, Skovgaard and fellow artist Johan Thomas Lundbye enjoyed taking excursions into the nature of Zealand to do open air sketches which would be used in the composition of later works. 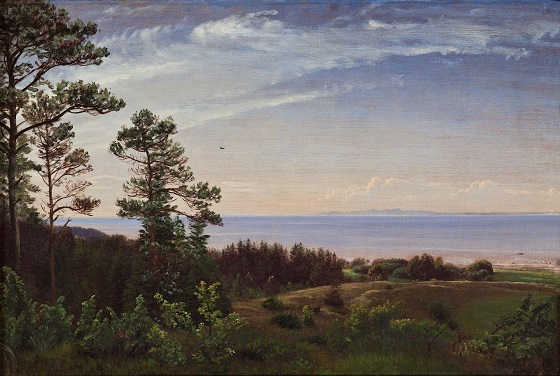 In this sketch, the artist has depicted a peaceful summer evening on the northern coast of Zealand with a view over Kattegat and the Swedish peninsula Kullaberg. The composition is dominated by light colours and horizontal lines, which helps give the landscape a calm and harmonious appearance. The detailed reproduction of the Danish vegetation in the foreground stands in contrast to the vaguely defined Kullaberg peninsula in the background. Besides creating a certain sense of depth in the painting, it also brings to light the relationship between the near and the far. The inspiration for this form of composition stemmed in all likelihood from the artist’s teacher, J.C. Dahl, who also sought to create depth in his landscapes by painting a detailed foreground against a more vaguely rendered background.